← What matters in teacher professional development? We all have gone to YouTube at one time or another to watch a video of some kind; educational or not so educational. We’ve watched the latest viral videos sweeping the world by storm for their hilarity, shock value, or powerful message. There’s no shortage of content to be consumed on YouTube. If you’ve never checked out YouTube’s statistics on their traffic you can go to their press page and give them a glance. An hour of video every second! That is astounding! More-so than ever, content is available in abundance via YouTube. We, including our students, can consume content constantly from any device with an internet connection. Have you ever stopped to think about what it means when you upload your own original content to YouTube? Things like: How do I upload something? What settings are crucial to know about? How is this applicable to my classroom and students? Whether you’re uploading content you’ve filmed yourself or uploading a screencast for your students, I thought I’d share some of the YouTube settings that I’ve found to be most important to make teachers and students aware of. 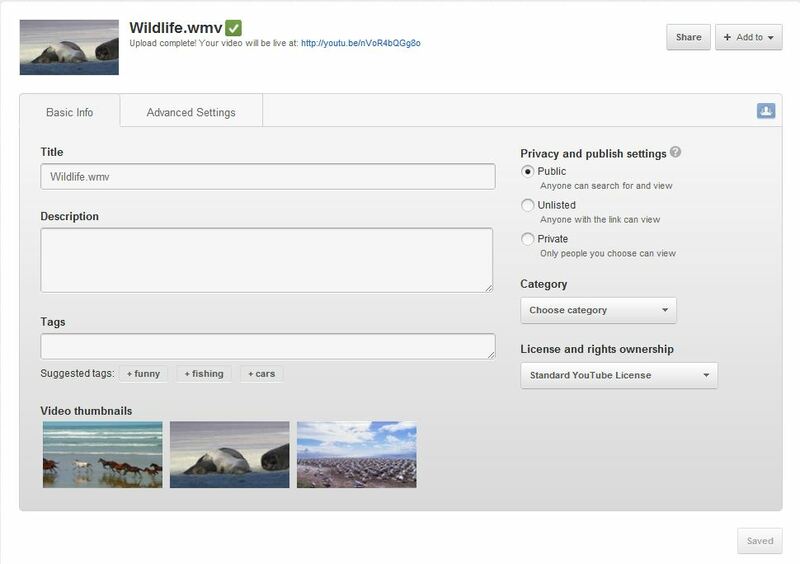 As your video starts uploading, you can go ahead and begin to enter basic information for your video such as the title, description (which appears below the video when someone watches it), and keywords you’d like to tag your video with. Once your video is done uploading, you can also choose the thumbnail image that your video will have (the still image that will show before clicking Play). Remember: these are items of information that you can always go back and edit later, so don’t feel like these are set in stone but it’s always something good to do while your video is in the process of being uploaded. YouTube also does a great job of automatically saving these changes while your video is uploading as well (YouTube is a great multi-tasker!). On the right side of the Basic Info tab (still on the upload page) you will see the Privacy and publish settings. These are very important settings to keep in mind, particularly for publishing student produced content. The screenshot below shows these settings. Public means that your video is out there on YouTube for the world to not only watch, but for anyone to find by searching for it. Unlisted means that your video will not be able to be located by searching for it on YouTube. The only way others can view the video is by you sending out its specific link. Private is another level of security beyond that. This is where you at the owner of the content can give explicit permission to only individuals you specify to be able to view the video. Again, these are settings specific to each individual video and can be changed at any time. Definitely important settings to know about. Videos uploaded to YouTube are set to public by default. Also at this point be sure to properly categorize your video. Everything I upload I make sure and categorize with “Education”. When I’ve forgotten to do this, I was quickly reminded because the “similar videos” section on the right side of my YouTube video were not usually the greatest. By that I mean they had absolutely nothing to do with the topic of my video and were sometimes inappropriate. You can also set the License and Rights Ownership of your video at this point. You can leave it at the standard YouTube license or mark your video with a Creative Commons attribution. If this option is chosen, that means you are giving others the right to use your work. This could look like someone using the YouTube video editor to incorporate your video into another video they have uploaded (with proper credit always pointed back to the source (link) of your original video). Be sure to check out the YouTube Creative Commons page for more information. Here’s some more important settings you’ll want to remember to check. Again, I like how this can all be done while the video is still uploading (especially if it’s a large video). The most important advanced settings you’ll want to notice when you click on the Advanced Settings tab, are the check boxes related to comments and ratings. There might be sometimes you don’t want to allow viewers to comment on a video that is uploaded. To do this simply uncheck the box next to “Allow Comments”. Or maybe you do want to allow comments but you want them all filtered through you first (this is a great option for student work that is uploaded). You can click the drop down menu and change that to “Approved”. You’ll also notice you can turn off the ability for viewers to vote on comments, give a rating to the video, or create a video response. You will also see syndication, embedding, and information such as adding location and date to your video. I have seen the comments feature work great for teachers and students, and also work not so great. Lastly, notice in the top right section of the upload page you will see two buttons: Share and Add to. If you’d like to immediately get the shortened link, embed code, or ability to share to another social network you will find all of these options by clicking on the Share button. If you click the “Add to” button, the newly uploaded video can be immediately added to an existing playlist or a new playlist can be created for the video. Another very handy feature. Above those two buttons you will find buttons for the Video Manager or clicking Add more videos will take you straight to uploading another video in the same manner. Inside the Video Manager is where you will find all of your uploaded YouTube videos where you can go straight to any single one to check all of these settings by clicking the Edit button. To reference back to creating screencasts, which I mentioned at the beginning of this post, I particularly like to use Screenr to create these. 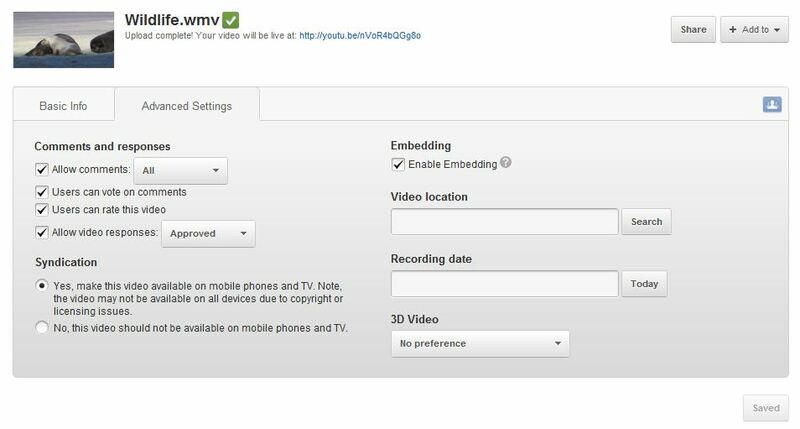 It’s web-based software and after recording them you can instantly upload them to your YouTube channel if you choose. It’s simple and works well consistently. If you do upload these to YouTube be sure to head to your YouTube channel and go through your basic and advanced settings for each screencast you create to make sure they are named, categorized, and privacy settings are all set how you need them to be. Whether teachers or students are publishing digitally, YouTube or not, it’s important to make the time to learn how to make the content work best and publish properly. While I’ve only scratched the surface, the “Googlers” have put together a great YouTube help site with loads more to learn about. We haven’t even got to the awesome video editor built right in. Maybe that calls for another post!